There are several exciting toy Postman Pat playsets to choose from in Character Options Postman Pat SDS range. Each Postman Pat playset toy can be connected to form the village of Greendale where Pat works. Train tracks are available for the Greendale Rocket and also connecting pieces to make a road as well as all the Postman Pat toy figures and vehicles which complete the set. The must-have Postman Pat toy is undoubtedly the Postman Pat Sorting Office Playset. Other Postman Pat toys available are the Postman Pat Post Office Playset, the Postman Pat Sorting Office Playset and the Ted Glen’s Garage Playset. Each Postman Pat toy playset comes with accessories and a figure. The Post Office Playset comes with a Mrs Goggins figure plus hopper and parcels. 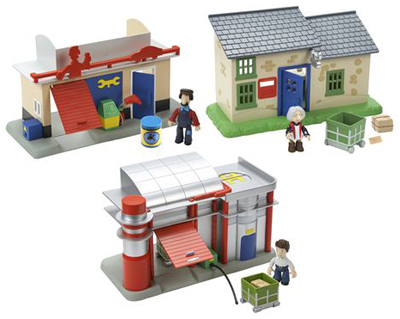 The Sorting Office includes a figure of Julian and features a working garage and hose that connects to the SDS vehicles. Ted Glens Garage playset obviously includes Ted Glenn with a drum and realistic fuel and air lines.